Your ability to earn money is one of the most significant assets that you have. Expenses often increase due to disability, while income is drastically reduced. In the event that you’re unable to continue to earn your income because of illness or injury for any period of time, your family’s financial plans could be ruined. Social Security includes a disability feature, but you’re considered disabled only if you can’t perform any work; you have to wait for at least five months to initiate benefits; and the amount you will receive will likely be less than half your income. The only way to protect yourself and your family from financial disaster is to maintain adequate disability insurance. Disability insurance replaces a portion of your income if you become ill or injured. It’s very expensive because the likelihood that you may need this benefit is relatively high. The risk isn’t something that you likely can bear yourself, so you must transfer the risk to an insurance company. Disability insurance companies won’t sell you an insurance policy to replace 100% of your income. However, they do sell policies that go up to about 70% of your current income. If you don’t have at least 70% of your current income provided through your employer’s disability insurance plan, you should obtain supplemental coverage to bring you up to 70%. If you currently need all your income to provide your standard of living and achieve your financial goals, you’re going to have trouble making ends meet if you only bring in 60% to 70% of your current income. What typically happens in real life is that people have to make drastic lifestyle changes— unless you obtain as much disability insurance as you can get. One of the most significant benefits of owning your own disability insurance policy is that because you pay the premiums, the benefits you receive (should you become disabled) are tax-free. Tax-free benefits of 70% of your current income may be extremely close to 100% of your current take-home pay. On the other hand, when your employer pays the premium on this insurance coverage, all the benefits you receive under this policy are taxable as ordinary income. Short-term disability insurance provides benefits from the eighth day of disability up to six months of disability. Most employers don’t provide short-term disability insurance benefits, and many individuals choose to self-insure for the first three to six months of disability if they’re buying private policies. Long-term disability insurance generally kicks in after the first six months of disability and typically pays benefits until age 65. Employer-sponsored, long-term disability insurance may provide own-occupation coverage for a period of up to two years. At the end of that two-year period of time, or in most cases from day one of your disability, the disability insurance policy pays benefits only if you’re unable to do any meaningful work that you’re reasonably trained to do. Insurance that guarantees to pay if you’re unable to perform the duties of your occupation is substantially more expensive than a policy that guarantees to pay benefits if you’re unable to work at all. Obtaining as much own-occupation, long-term disability insurance as you can afford makes sense if you have a specialized occupation that would require you to take a significant pay cut in order to work in a different capacity. However, if own-occupation disability insurance is cost prohibitive, having some long-term disability coverage is better than having no coverage at all. 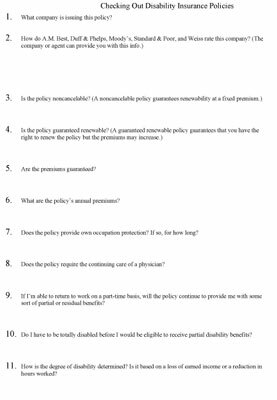 The Checking Out Disability Insurance Policies Worksheet lists questions regarding key disability insurance features and benefits that you should consider in order to evaluate your current disability insurance and any additional coverage that you need to obtain. Use it to begin your comparison shopping. Click here to download and print the Checking Out Disability Insurance Policies Worksheet.